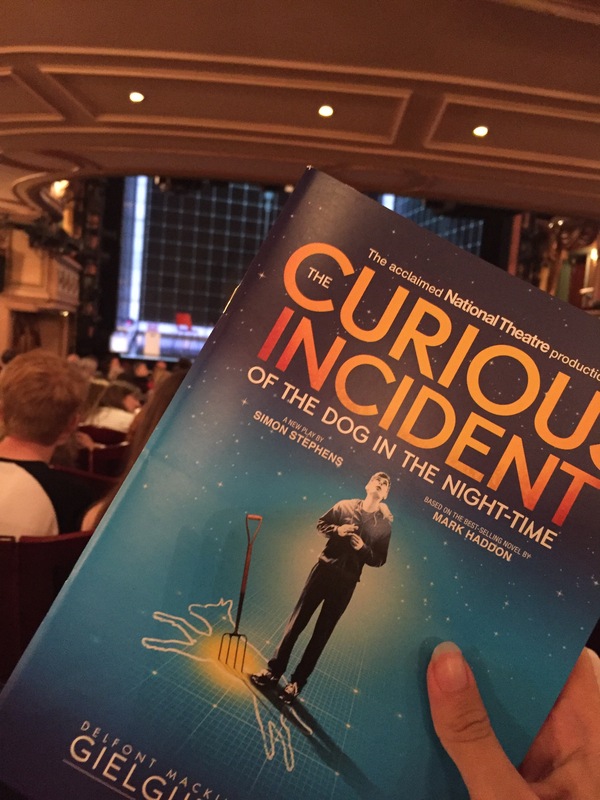 Yesterday was my 19th birthday, and since there is nothing I love more than a theatre trip me and a group of my friends went to see “The Curious Incident of the Dog of the Nighttime” at the Gielgud Theatre in London, so I’ve decided to try something new and review it. Fair warning – this may contain spoilers!! 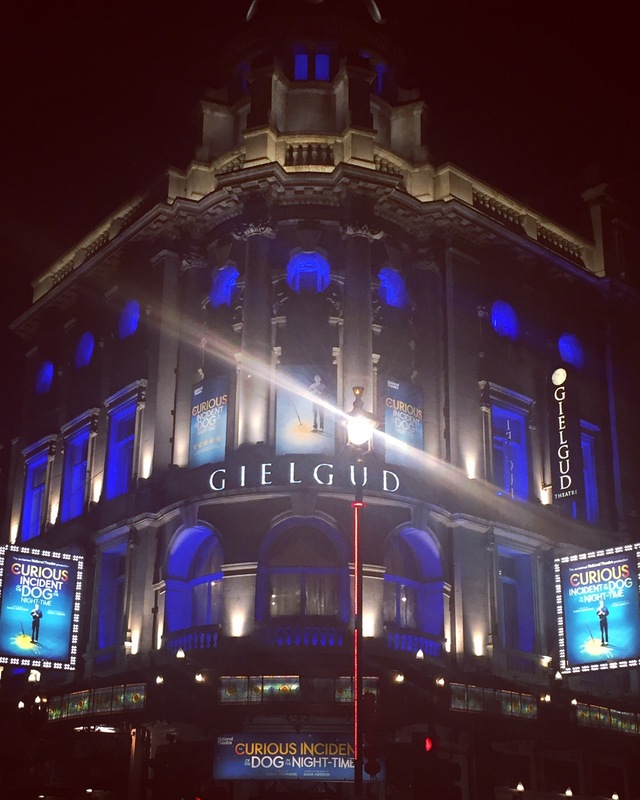 Following the story of Christopher Boone (played by Joseph Ayre), a severely autistic teenager who makes it his mission to detect the mystery of who killed Wellington the dog, the play takes a turn and follows the unravelling of a string of terrible lies that his father has told him and how he comes to terms with the harsh truth about his family. The play opens with sporadic flashes of light that reveal the carcass of a dead dog that has been killed with a pitchfork. Though it was a bold opening , it was extremely unnerving and made for a gripping start that made me quite uncomfortable. However, the tension was quickly dissipated by a following humorous scene between Christopher and a police officer. The lighting (designed by Paul Constable) and sound (designed by Ian Dickinson) are featured throughout the show. I personally adored the way these had been designed. Almost a visual representation of Christopher’s complicated, mathematical mind, there were a lot of techno sounds and gaudy bright white lights throughout. At some of the more tense points a lot of the sound effects were loud, screeching and almost painful to listen to – however, as uncomfortable as this made me, it added to the tension of the scene and heightened the experience, leaving me on the edge of my seat at some points. I cannot praise Joseph Ayre for his performance of Christopher Boone highly enough. Playing an autistic character is a massive challenge, and he has brought Christopher to life with a huge amount of sensitivity, humour and depth. On top of this, his skills in physical theatre are swift and mesmerising to watch. 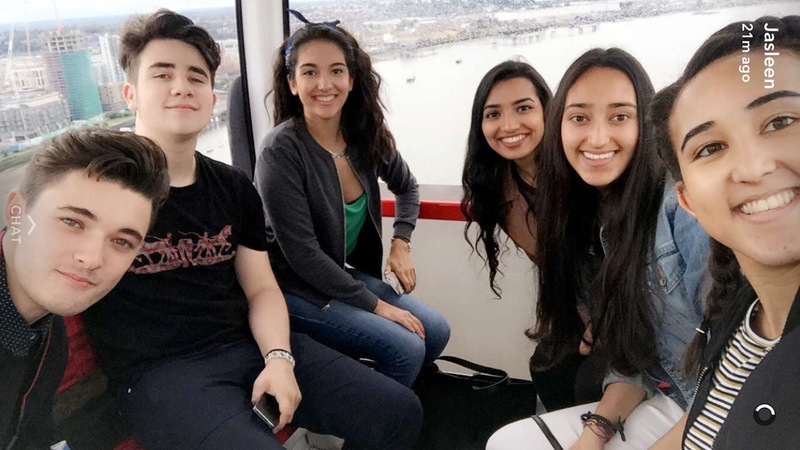 One standout moment for me was when he explained his dream to be an astronaut and work for NASA with his pet rat, trusting his fellow cast mates entirely to carry him around the stage and turn him in the air to show zero-gravity. Without revealing too much, my only criticism of the show is that it jumps out of real time into flashbacks too much for my liking, often leaving the audience slightly confused and one step behind the action trying to catch up. 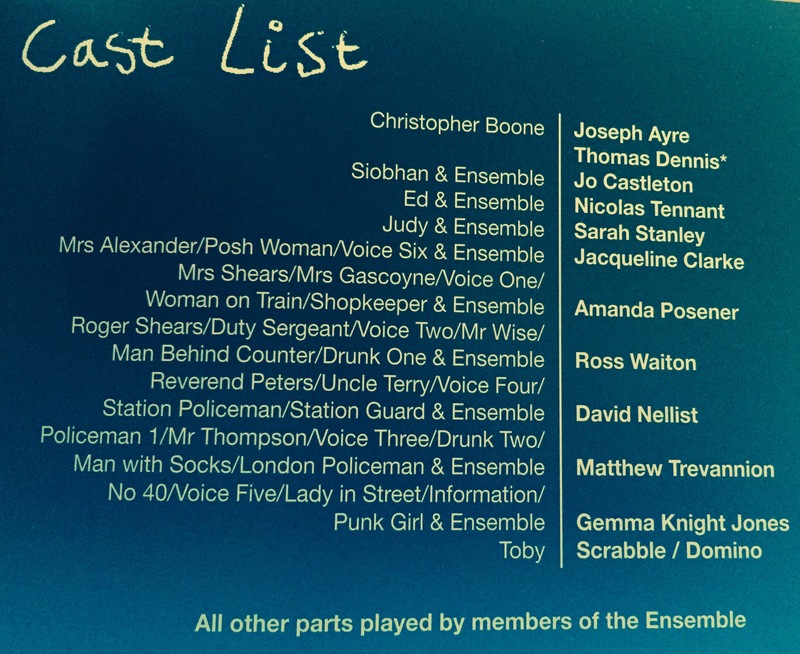 This particularly caused a problem for me near the start of the show, and as a result of this it took me until the end of Act 1 to work out who the character of the narrator actually was. Further standout performances for me include Nicolas Tennant for the sensitive portrayal of Ed Boone, and Jo Castleton for her portrayal of the kindly Siobhan. I haven’t read the book on which the show is based, and so it is impossible for me to confirm how true the play has stayed to the story. However after last night, it has quickly reached the top of my to-read list. The show had the perfect amount of humour in it to relieve the pressure of the heavy storyline, without making a mockery of the serious issues the show deals with. I thoroughly enjoyed my evening and would recommend this show to anyone.